Two-thousand posts probably isn't a big deal to most of you, however, this ding is not an ordinary ding, it is a dong. Today marks the eve of Kuwoobie's™ fourth year on Alla, it is! To honor this occasion, we will honor each of you by listing your names in a row. That's not even the best part! Because Darqflame has failed to give Kuwoobie™ an order as her slave, we will leave that up to one of you. Please note that only a person from the list below will be allowed to give Kuwoobie™ a command. The final decision as to who's command he must obey will be decided by everyone using either a poll or by popular demand. If a decision is not reached by February 2nd, 2012, a command will be chosen at random. I like how Tarv is just Tarv. Seriously, what the f*ck nature? This is grain, which any fool can eat, but for which the Lord intended a more divine means of consumption. Let us give praise to our maker and glory to his bounty by learning about... BEER. Also, rate me up, *****. I hate you more than church and learning. Just punch her in the vag and tell her to @#$% off. Don't rate someone down on a ding thread, you retards. They get their ding threads if nothing else. I was has an mentioned. I switch back between FFXI and World of Warcraft all the time. I'm too lazy to change my sig. You guys keep tossing facts out there like they mean something. Aww, I'm the White Rabbit. I love the White Rabbit! 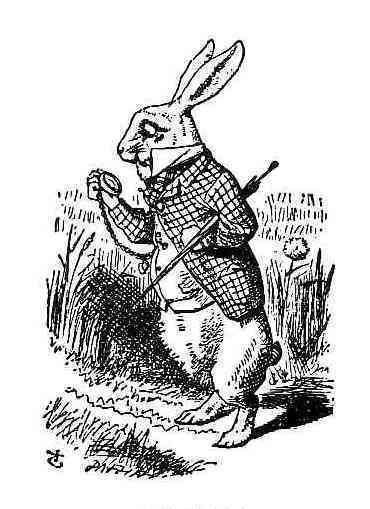 You always reminded me of the White Rabbit for some reason. Samira will always be a gnome to me. Samira is absurd in concept but very prim and proper in delivery. I guess I should feel honored for the mention but I don't. I'm gonna go call Iggy, atleast he remembers me. And always on the verge of being late! and if I wore gloves I'm sure I'd lose them. I'm going to narrow down the command options by repeating this. Not just an mention. A honorable mention! Ash made a genius observation. Congrats Kuwoobie™ and thanks for the mention. Kuwoobie is a registered trademark and used under license. I was thinking about you the other day, Kuwoobie. I wanted to see how you were doing, and make sure you weren't still considering suicide. So my command to you is not to kill yourself. I never really understood that. All this posturing "Oh, you have so much to live for!" and other ********* I figure if they want to go, go. Not like this planet has the room for people who don't want to be here. It's sad that this forum has plenty of room for ****** threads though. So grats on 2k or whatever. I never really understood that. All this posturing "Oh, you have so much to live for!" and other bullsh*t. I figure if they want to go, go. Not like this planet has the room for people who don't want to be here. It's kinda fun to command people, though.